City's Professor of Hydrodynamics was granted the CH Kim Award by the International Society of Offshore and Polar Engineers (ISOPE) in recognition of his outstanding technical achievements in and exceptional contribution to floating-body dynamics. Professor of Hydrodynamics, Professor Qingwei Ma, has been granted the CH Kim Award by the International Society of Offshore and Polar Engineers (ISOPE). He is the first academic from a UK university and the second from Europe to have received the Award. 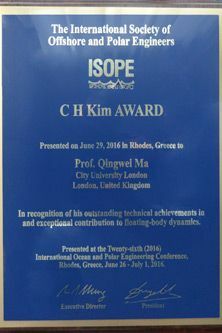 Professor Ma, who joined City in 2002, was presented with the CH Kim Award, 'in recognition of his outstanding technical achievements in and exceptional contribution to floating body dynamics', during the 26th ISOPE Conference, which took place from 29th June to 1st July 2016, in Rhodes, Greece. The Award is named after Professor Cheung Hun Kim who was an internationally recognised authority in the fields of naval architecture, ocean engineering, marine hydrodynamics, and wave mechanics. Professor Kim, a founding member of ISOPE, was also a pioneer in the numerical wave tank. Professor Ma is currently a Principal Investigator on several Engineering and Physical Sciences Research Council (EPSRC) projects related to wave dynamics and wave-structure interaction. In recognition of his outstanding contribution to the International Conference on Computational & Experimental Engineering and Sciences, Professor Ma was made a Distinguished Fellow of the Conference in 2014. He received the Vice-Chancellor’s Award for Excellence in Learning and Teaching in 2015, and was elected to be a member of Board of Directors of the International Society of Offshore and Polar Engineers (ISOPE) for the period 2016-18, starting from 1st July 2016. Offshore Engineering (also referred to as Ocean or Marine Engineering) deals with all matters related to the utilisation and exploration of ocean resources, including but not limited to oil and gas extraction, marine renewable energy (offshore wind, wave and tidal power) harness, and ocean-bound transportation. Wave dynamics and floating-body dynamics (the dynamics of floating structures in waves) are important scientific areas within Offshore Engineering.